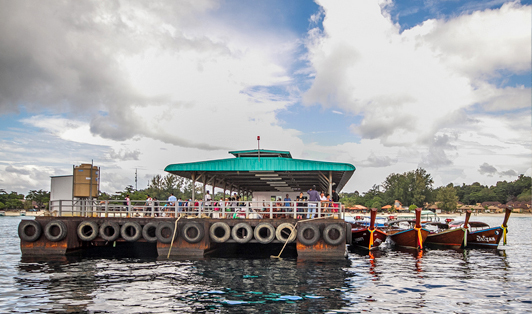 There is no ferry pier on Koh Lipe. However, the ferry boarding process is a simple and fun experience. Simply show the ferry staff your printed e-ticket that we have sent to you. The ferry operators will take this from you and replace it with a sticker that you will wear for your ferry trip. The staff are all familiar with us at phuketferry.com and your ferry boarding process is going to be 'plain sailing', a little exotic even - local longtail boat operators will taxi you to your awaiting high-speed ferry that's sitting just offshore. When arriving it is a similar process. Due to the fact that ferries cannot come in all the way to Koh Lipe, the local Chao Ley (Sea Gypsies) will come to collect you at the ferry with longtail boats (this is perfectly normal). They will take you to any beach on the island for 50 baht, though please note that this price will be extra and not included in your ferry ticket.